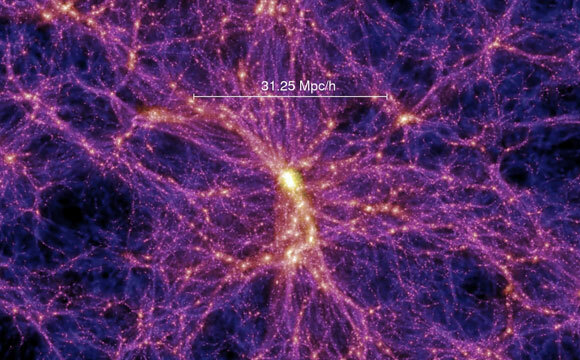 New research shows that the majority of missing ordinary matter is found in the form of a very hot gas associated with intergalactic filaments. Matter known as ordinary, which makes up everything we know, corresponds to only 5% of the Universe. Approximately half of this percentage still eluded detection. 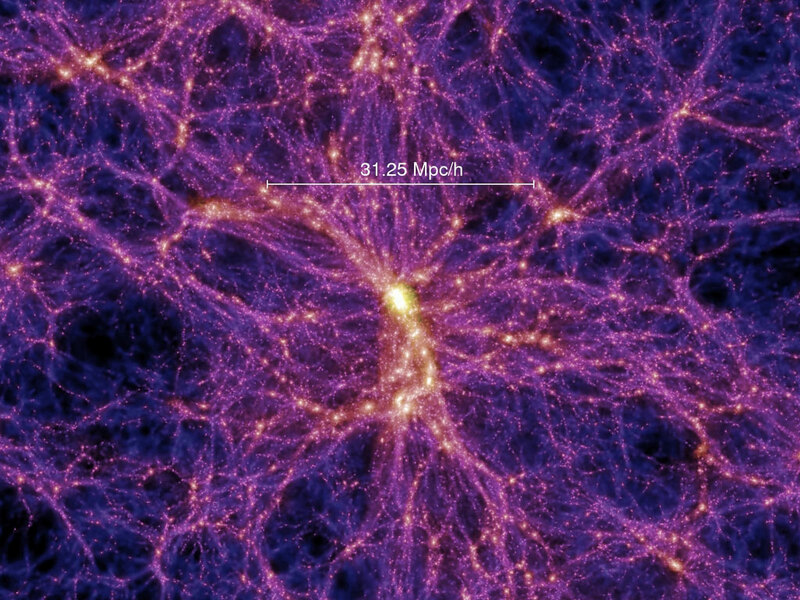 Numerical simulations made it possible to predict that the rest of this ordinary matter should be located in the large-scale structures that form the “cosmic web” at temperatures between 100,000 and 10 million degrees. A team led by a researcher from the University of Geneva (UNIGE), Switzerland, observed this phenomenon directly. The research shows that the majority of the missing ordinary matter is found in the form of a very hot gas associated with intergalactic filaments. The article reporting this discovery is published in the journal Nature. Galaxies are formed when ordinary matter collapses then cools down. In order to understand the origin of this formation, it was vital to discover in what form and where the ordinary matter that we do not perceive—known as the “missing baryons”—is found. To do this, the astrophysicists from UNIGE and the Ecole polytechnique fédérale de Lausanne (EPFL) took an interest in Abell 2744, a massive cluster of galaxies with a complex distribution of dark and luminous matter at its center. They observed this cluster with the XMM space telescope, which is capable of detecting the signature of very hot gas due to its sensitivity to X-rays. Large-scale galaxy surveys have shown that the distribution of ordinary matter in the Universe is not homogeneous. Instead, under the action of gravity, matter is concentrated into filamentary structures, forming a network of knots and links called the “cosmic web”. The regions experiencing the highest gravitational force collapse and form the knots of the network, such as Abell 2744. Comparable to neural networks, these knots then connect to one another through filaments, wherein the researchers identified the presence of gas, and consequently, the missing baryons. The astrophysicists pointed XMM in the direction of the areas where they suspected to find the presence of filaments, and therefore, the presence of 10-million degree hot gas structures. For the first time, they were able to measure the temperature and density of these objects, and found that they corresponded to the predictions of the numerical models. For this reason, we now have a grasp of the form taken by the missing ordinary matter. This research is a very significant validation of the models of galaxy formation in the Universe. “Now we must verify that the discovery of Abell 2744’s missing baryons is applicable to the entire universe. This will consist in studying these filamentary regions in detail, and measuring their temperature distribution and the various atoms that compose them, in order to understand how many heavy elements there are in the universe,” says Dominique Eckert, led scientist. In fact, if the researchers manage to measure the atoms in these filaments, they will be able to estimate the number of heavy nuclei formed by stars since the beginning of the universe. In order to deepen this research, the European Space Agency (ESA) is in the process of developing a new space telescope. Switzerland and the researchers from UNIGE are especially involved in this project. The telescope, named Athena, should be operational in the mid-2020s. 3 Comments on "New Research Reveals the Mystery of Missing Ordinary Matter"
Excellent article. There are no missing matter in absolute state of spacetime, but antimatter-matter, darkmatter-matter (equator of self-contradiction)complementarity, as Principle of Included Middle, eternal oneness of relative pairness; the self-creator of All in all (Cosmos). where 1, is absolute spacetime, 5, is ordinary matter, and -4, is antimatter-darkmatter. -Aiya-Oba (Natural philosopher and discoverer of Nature’ absolute logic and state: equator of self-contradiction, Quantum-Continuum-Entanglement). Matter known as ordinary, which makes up everything we know, corresponds to only 5% of the Universe. Approximately half of this percentage still eluded detection….. Thus this article is to detect still undetected about 2.5% of ordinary matter, which it states to exist as filament and knots in the cosmos but never accounts for all the rest 95% of the missing mass of the Universe which exists still as Dark Matter and Dark energy only. Anti-matter is the other compliment form of this Real Matter only and it ceases to exist permanently. Dark Matter is totally different kind of Bosonic matter like W+ W- and Z Bosons which can create matter out of them. Thus the big chunk which can send all the galaxies spinning around at fantastic speed to expand the Universe and that keeps all the matter like Sun, Black Hole, and galaxies spinning around without bundling one over the other is still eluding for detection of its structure. Thank You. Thank you Madanagopal.V.C., for your interest in Nature’s absolute logic and state: equator of self-contradiction. Cosmos at all scales is absolute unity of self-contradiction relativity complementarity. Space is simultaneously absolute (self-completeness)unity, and relative (nonself-completeness) units, as wave and particles singularity, nonlocality and locality, antimatter-matter, dark-matter-ordinary-matter complementarity, by Principle of Included Middle; equator of self-contradiction, it’s the absolute entanglement, the eternal oneness of relative pairness of All in all (Spacetime-Continuum). Hence the numerical relation as above: -4 + 5 = 1, is good. -Aiya-Oba (Philosopher and discoverer of Nature’s absolute logic and state: equator of self-contradiction, absolute oneness of relative pairness).